Apple’s ads tend to imply that you need to be some kind of artist if you want to buy an Apple Pencil, but it’s great for plenty of other things, even if those things don’t look so hot in the latest TV spot out of Cupertino. Not everyone needs to use an Apple Pencil, but you’ll get a lot of use out of one if you frequently find yourself in the situations below. A few pointers before we begin. First, as a rule of thumb, if you’ve never found yourself thinking that some iPad activity would be easier if you only had a pen, you probably don’t need an Apple Pencil. Second, there’s a whole range of cheap styluses you can use with an iPad instead of an Apple Pencil for these tasks, but keep in mind that they won’t have Apple’s pressure technology or the Pencil’s sleek design. Many feel like you’re writing with a stubby crayon. Some of us are still nuts enough to write the occasional first draft by hand—I’m one!—and no other combination of electronic devices really captures the experience of writing with paper and pencil quite like the iPad and Apple Pencil. Paper and ink still have the edge—even with its admirable precision, the Apple Pencil still feels a bit like a marker—but the Pencil and iPad nudge us a lot closer to ditching paper than I once figured we’d be at this point in history. Here’s a simple mind map I made for this story with the 2018 iPad Pro. This arrangement works well enough for traditional writing and outlines with the right apps, but sure, you can just as easily do these things by typing. 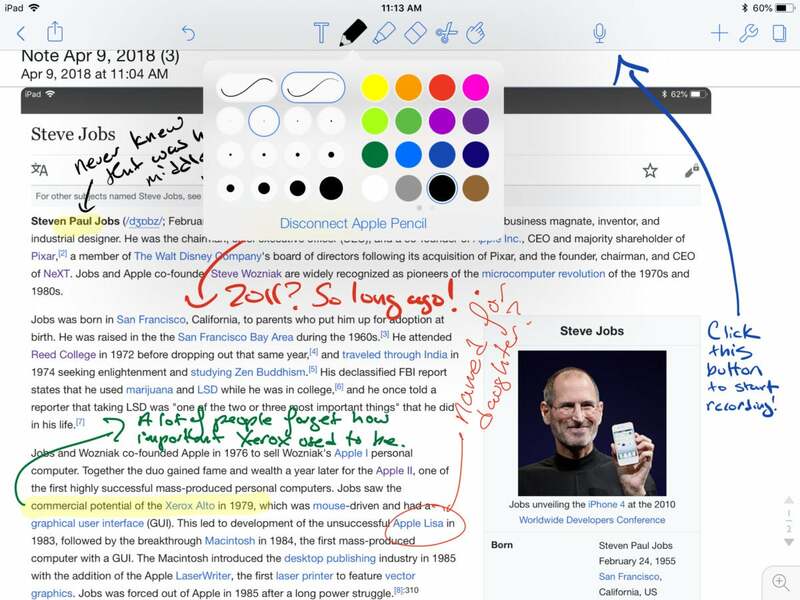 The Apple Pencil, though, shines because it allows you circle key items in your notes, easily make highlights, and scribble comments in the margins when you’re using specialized apps like MyScript Nebo or Notability. Word processing software still doesn’t successfully mimic this kind of organic drafting, and the Pencil helps you enjoy that process without killing a forest. Setting up a virtual desktop program such Chrome Remote Desktop on my iPad saved me a couple of times when I needed to remotely access a file that’s only available on my desktop PC. The catch is that it’s sometimes awkward to interact with the interface of my Windows machine with my iPad’s display, particularly when I try to “right-click” with my fingers. Most of the time, I can’t wait until I’m done. Apple Pencil makes this process more bearable. It’s almost fun. The slender Pencil makes it a lot easier to pinpoint small icons my fingers would normally obscure, and holding down the Pencil to “right-click” feels a little more intuitive. It’s still not as ideal as using a mouse, but it comes darn close. It’s certainly a big improvement over prodding with my stubby fingers. Got a TV that that works with AirPlay? Got an HDMI dongle for your iPad? If you do, you can hook up your iPad to an external monitor and use it for presentations. Plenty of you already know this thanks to Keynote or PowerPoint. With an Apple Pencil-compatible app like Notability or Microsoft OneNote, though, you can use your iPad as a “whiteboard” in meetings for making mind maps, rough diagrams, or just for jotting down ideas. It makes for a significantly more interactive experience in meetings than merely showing some slides to your coworkers. The humble PDF is still with us and thriving, particularly in universities, schools, and businesses. I personally still see a lot of PDF contracts I need to sign, With the help of an app like PDF Expert, you can use your Apple Pencil to highlight text in a PDF, scribble marginal notes, and make editing marks as easily as you might with a piece of paper. You can mark up anything, really. Just take a screenshot and go to town. Apple Pencil works just as well with Apple’s screenshot markup tool that’s now built into both macOS and iOS. It substantially simplifies actions like circling text or elements in a photo or making arrows to point to something. Just scribble on the screenshot as though you’re writing on paper and you’ll be ready to send it to someone. I suppose this technically still counts as “art,” but I’m a big fan of how easy it is to edit photos in Adobe Lightroom with an Apple Pencil. It’s a simple enough task with a MacBook and a mouse, but somehow it always feels like work. The experience is so much more pleasant on the iPad when I’m using my Apple Pencil. When I select a specific area with the Pencil, it feels as though I’m “painting” the image. It allows me to be more precise than I would have been with my fingers. Even adjusting the various sliders with the Pencil feels more enjoyable, and I’ll go so far as to say that it inspires me to be more creative than I would have been if I’d just used a mouse. Considering that Lightroom feels this way, I have a lot of hope that Photoshop will be just as impressive when it finally drops sometime this year. And that brings me to my last point. I would never suggest that someone buy an Apple Pencil for this reason, so let’s consider it a complementary feature to the stuff above.